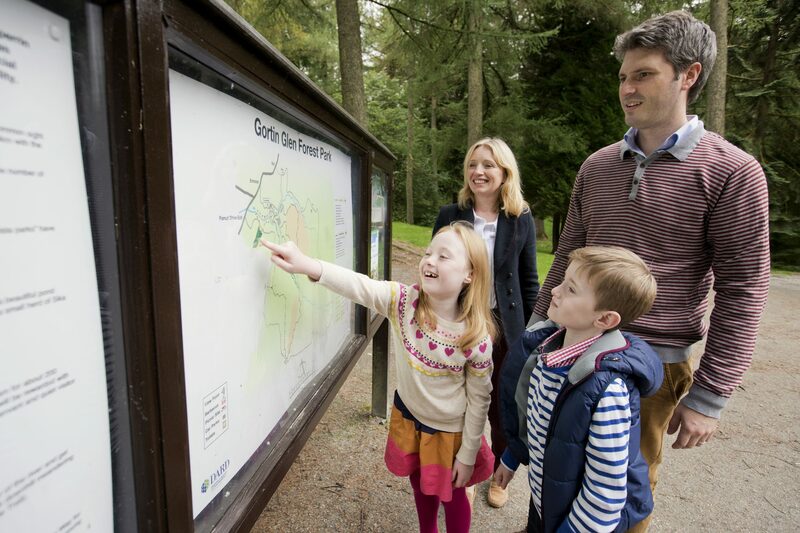 Gortin Glen Forest Park is six miles north of Omagh at the western gateway to the Sperrin mountains. The Forest is owned and managed by Forest Service NI. The International Appalachian Trail / Ulster Way pass through part of the forest. There is also a youth camp site. A major recreational feature of the forest is the five mile long drive which offers some breathtaking views. A number of vista parks have been created where the motorist can pull in to enjoy the magnificent scenery. A range of waymarked trails start from the finger post in the main car park. They give the visitor the chance to enjoy the Park’s natural flora and fauna at its best. All the trails are coded and return to the car park. As well as walking, horse ride is permitted in the southern section of the forest with a permit. Orienteering trails can be devised to suit all ages and abilities. There are also camping and BBQ facilities on site. Inspired by its natural surroundings, the wooden sculpture is sure to fascinate the kids with plenty of opportunities for exploration and play. Opening times: Open daily 9am until dusk.